New! Neuroscience declares telepathy to be proven fact! 1 in 7 Scientists know of Faked Data! SCEPCOP is the 1st Coalition of Researchers, Investigators, Writers, Truth Seekers, Freethinkers and Intellectuals united to counter and expose the PseudoSkepticism movement for their fallacies, religious fanaticism, unscientific behavior, misinformation, denial, suppression, bigotry and ridicule toward all data, experience or science that challenges orthodoxy or does not fit into a materialistic paradigm. We do not support every quack claim out there, but advocate true skepticism, proper application of the Scientific Method, objectivity and unbiased open inquiry toward all paranormal and unconventional data. We are the world's first counter-pseudoskeptic movement providing resources, articles, books, videos and an online community. We support the proper application of the Scientific Method, which involves the updating of one's hypothesis to the fit the data, rather than rejecting any and all data that doesn't fit into an a priori hypothesis, which the PseudoSkeptics do, which is totally unscientific and the antithesis of the Scientific Method. The Paranormal is one of the most exciting frontiers today. Research into Consciousness, Quantum Physics and Psychic Phenomena, etc. explores venues that are unlocking the mysteries of the universe and gateways to other dimensions or levels of reality and consciousness. These provide deeper insights into a larger nature of reality, revealing insights into the meaning of existence and spawning hope for a better future in which humanity's consciousness and awareness are elevated to new heights, transcending greed, lust for power, hatred, violence, ignorance, and the confines of a materialistic paradigm that keeps us living in fear. Therefore, the study of the Paranormal is a key stepping stone for humanity's next stage of evolution. However, standing in the way are groups of organized fundamentalists who call themselves "skeptics" but in reality know nothing about the true meaning of the word nor practice it. In fact, they've hijacked the word to mean its opposite. Rather than inquiring, or asking questions to try to understand something, they seek to debunk, discredit and ridicule anything that doesn't fit into their belief system. Pyrrho, the founder of "Skepticism", intended for it to be about open inquiry and suspension of judgment. "I've never trusted skeptics, for the very reason that they are willing to accept the official version of things without a shred of proof but require unrealistic amounts of evidence to accept any other possibility." Therefore, in truth and by their actions, these pseudoskeptics (who call themselves "skeptics") are NOT open minded truth seekers who question things and are attuned to possibilities. Rather, they are ridiculers and prosecutors of anything that strays outside the status quo or challenges the official version of things. They are defenders of orthodoxy and materialism. And they will distort, dismiss, obfuscate and play "verbal hopscotch" to get their way. They've hijacked the term "skeptic" to refer to the one who suppresses the act of questioning, rather than to the questioner himself. In doing so, they've pretended to be the opposite of what they are to hide their true agenda, which is to protect the agenda of the status quo power elite and keep people remaining sheeple. See here for more info. Additionally, they've hijacked terms such as "rational, reason, logic, critical thinking" to mean the "proper" thinking and behavior that supports materialism and orthodoxy, and rejects against anything that challenges it. That is not what those words mean of course. It's a form of mind control and disinformation. And it seems way too calculated and militant to be due to some accidental misunderstanding, ignorance or closed mindedness. Hijacking a word to mean its opposite is more indicative of a deliberate agenda, such as a disinformation campaign or form of mind control. If that sounds terrible, well, we are here to expose it thank goodness. 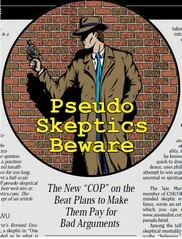 The pseudoskeptics have formed organizations such as CSICOP (Committee for the Scientific Investigation of Claims of the Paranormal, now known as CSI - Committee for Skeptical Inquiry), JREF (James Randi Educational Foundation) professional Skeptics such as Michael Shermer of Skeptic Magazine, as well as many smaller groups, blogs and online communities. In media reports and programs on paranormal phenomena, these skeptics are often presented as the final authorities on the matter and go virtually unchallenged. And unfortunately, most paranormal/psychic researchers have neither the time nor interest to debate these debunkers. So now it's our turn to form a counter movement. Enter SCEPCOP. 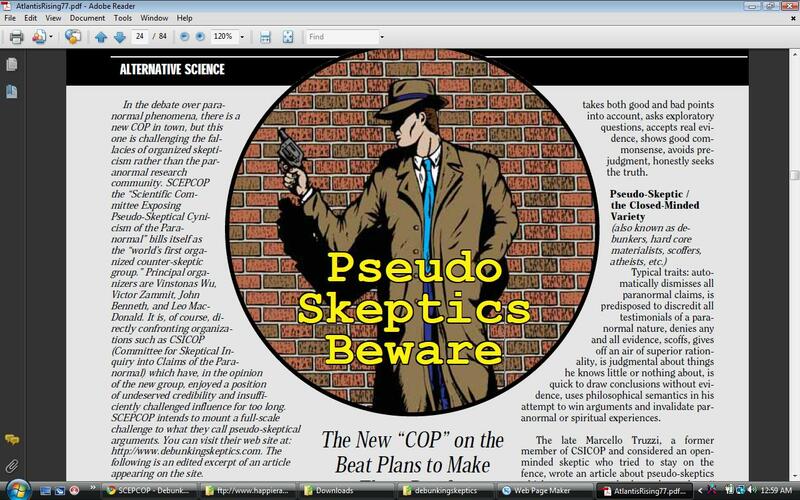 As CSICOP was formed to "police the claims of psi", SCEPCOP now in turn acts to "police the pseudoskeptics". We will debunk their arguments, and reveal their fallacies, misinformation, agenda, denial, inconsistencies, pseudo-dogmas posing as "rules of logic" and double standards, showing that they are not objective truth seekers. Back in 2001, we were the first to write a book length treatise debunking 30 primary arguments of these pseudoskeptics. Much needed at the time, it quickly became acclaimed in paranormal circles as a comprehensive masterpiece and first-of-its-kind. And now he's taken it to the next step in forming the SCEPCOP coalition, a movement needed and long overdue, evidenced by the attention that SCEPCOP received from many paranormal websites. Just to state for the record though, opposing pseudoskepticism does NOT mean that SCEPCOP endorses every crackpot claim, theory and fantasy out there. Not at all. We believe in applying equal skepticism to both sides, as well as the objective weighing of evidence, for as you might expect, some claims and phenomenon have a lot of solid evidence to back it up, while others have little or none. One thing to keep in mind. All pseudoskeptics will claim to be true skeptics, just like all high pressured salesmen claim to not be high pressure, all liars and con artists claim to be sincere, and all politicians claim to be honest. But as you know, ACTIONS speak louder than words, so the proof of what they are is in their ACTIONS, not words. If a salesman for example, told you "I am not a high pressure salesman" but then proceeds to pressure you to buy his product/service, becoming pushy and not taking no for an answer, then what do you believe, his words or his actions? Likewise, when a skeptic tells you that he is a true skeptic who is open to evidence, yet he displays all the characteristics, traits and behaviors of a pseudoskeptic, do you listen to his words or his actions? The answer is obvious. Anyhow, thank you for your attention and interest. For a quick rundown of major pseudoskeptic fallacies, see the links in the left sidebar or start here. Then see the Main Treatise debunking the pseudoskeptic arguments and fallacies. In the left menu bar you will also see links to my other debunking articles, links about pseudoskepticism and latest research and developments. On the right sidebar you will see latest news and a variety of resources to aid your understanding. Below, you will see some relevant and interesting videos followed by a list of our Committee Members and links to their work and research. If you would like to join our Mailing List , join SCEPCOP or submit an article to us, you may do so in the contact link in the menu bar. To discuss any of these topics, visit our Discussion Forum. Thank you for visiting us, and if you have any questions, Contact Us. Copyright © 2009 - 2011 Dyan Gonzales. All Rights Reserved. Shift Happening - What's Next? Critique of Blackmore's "Dying to Live"
Has CSICOP lost the thirty years war? What are the best dissertation writing services in the UK? A Role Of PHP: Smart or Smarter? How long does it take to receive a refund from Amazon? Lloyd Pye - Everything You Know About Human Origins Is Wrong! View statements from expert Structural Engineers and decorated Pilots who challenge the official 9/11 story. Seeking Assisted Living in Phoenix? Razinn Care offers personalized senior care in a cozy home setting.